Portable Mini Ice Maker in a Stainless Steel look. Makes up to 27 lbs. of ice 24 hours. Makes ice in as little as 7 minutes. A countertop ice maker can be a convenient necessity when having a party or gathering where a large amount of drinks are going to be served. Ice in the cooler can melt quickly and people want their drinks cold so ensuring there is enough ice to go around should be a priority when serving your guests! Even if your fridge makes ice, it may not be enough and store-bought ice can also melt quickly so the best countertop ice maker can be just the thing you need to make sure your party is fully stocked. Another great thing is that most countertop ice makers are portable so you can take them with you if you are going camping, boating, or to a friend’s party! Below are some of the best countertop ice makers for you to consider when making your own purchase. The Magic Chef Ice Maker is for the connoisseur who wishes to have the best item available on the market, with no worry about the expense of it since it will give you the peace of mind of having the best ice maker on the market. 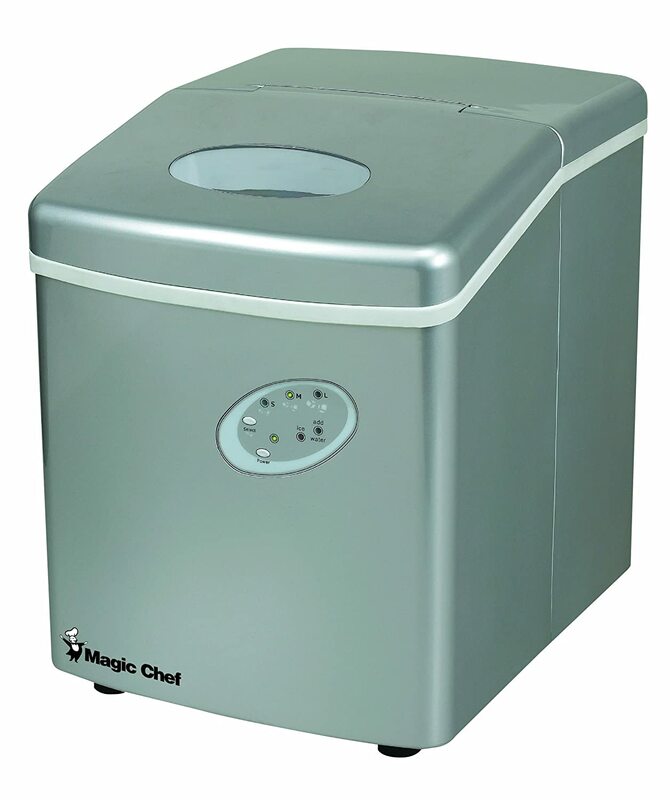 Our top pick for the best ice maker is this Magic Chef Ice Maker for many reasons. It can make ice in as little as 7 minutes and as much as 27 pounds of ice in 24 hours. This can be great if you are in a hurry and need ice in a matter of minutes or if you need a large amount of ice over night. One of the things people generally should keep in mind when looking for an ice maker is the size of the ice, so one of the great things about this particular model is that the ice cubes can come in three different sizes to fit all of your needs. It can hold up to four pounds of ice in its storage bin which can be extremely convenient when you are running out of room to put everything. It can make nine ice cubes per cycle, so if you feel that this is not enough you might want to plan ahead and make sure there are enough ice cubes ready. The device also comes with an indicator light that lets you know if the bin is full or if the water is low so that you never have to worry about running out. It has a see through window so you can look in to ensure everything is running properly and your ice is getting ready to be served. There is also an exterior drain which is extremely helpful for keeping it clean and reducing your overall clean up procedure. Additionally, the water and ice clear out easily. The exterior is a nice silver color that will work well in most kitchens and entertainment areas. The portability of the machine is also an added convenience for those looking to take their ice on the road. It is relatively small with dimensions of 14.5 x 11.7 x 14.9 inches and a weight of a little over 26 pounds, so it will not take up too much room or be too heavy. Although some may consider it a little pricey for an ice maker, all of the added features of this product make it worth it. The listing price is originally $179.99, however, some retailers may offer discounts if you look around. Additionally, there is always the option to buy used but that can present some problems so be careful and look into the seller and the cleanliness and reliability of the ice maker before venturing down that particular path. This top pick ice maker could really enhance your entertaining experience and ensure that there are enough cold drinks for everyone. The ice maker that is considered the runner up pick is the portable ice maker by Avalon Bay Portable Ice Maker AB-ICE26S. The silver color of this particular ice maker blends well in most kitchens and adds a polished look without taking up too much bar space. It can produce up to 26 pounds of ice daily which is just slightly less than the Magic Chef ice maker, part of the reason it lost out on the number one spot. However, it can make ice just a little bit quicker, producing it in about six minutes. 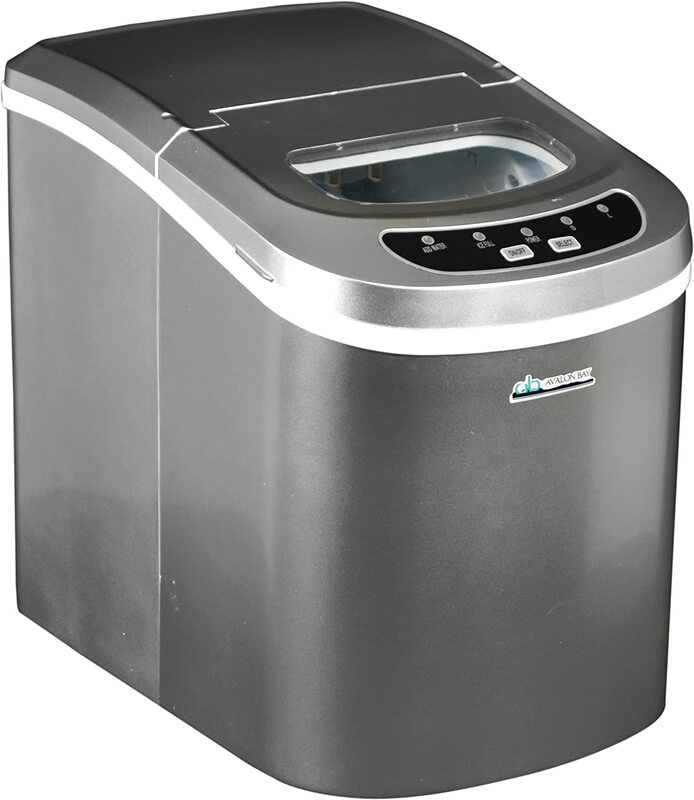 The Avalon Bay Portable Ice Maker AB-ICE26S only has the option of producing ice in two sizes, which are small and large, as opposed to three with the magic chef. However, two is still better than one! This also has an indicator light to alert you to when the tray is full or it is out of water. It also has the added convenience of automatic overflow protection. It is small and lightweight at only twenty pounds, which can be extremely convenient if you are planning on taking it on trips with you often. The drain at the bottom makes for an extremely easy clean up. Additionally, it comes already equipped with an ice scoop and basket for your scooping convenience. The buttons are clearly labeled and easy to use, so there should be no problems with using it once it is plugged in to an outlet. If you leave any ice in the storage tray, it will melt back in and be recycled into fresh water and ice. The listing price for this ice maker is actually higher than our top pick at $209, which is another reason people may decide to opt for the Magic Chef ice maker. Again, some retailers may be able to sell this particular appliance on sale or at a lower price if you shop around. The third-place ice maker is the Ivation 48-Pound Daily Capacity Ice Maker. It is the largest and most expensive of the ice makers in the list. Some people may find they do not require all of that ice and that it takes up too much room or is too heavy. 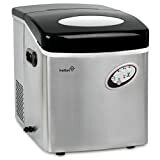 However, if you often entertain extremely large groups of people and need a substantial amount of ice, the Ivation 48-Pound Daily Capacity Ice Maker model is the way to go. This model allows you to choose from three different sizes of ice and alerts when it is at low capacity or out of water. Additionally, it comes with a removable tray so you can easily and conveniently transport ice wherever you need it. There is a see-through window at the top so you can check on the level of the ice and the functions whenever you feel it is necessary to do so. As previously stated, it has the largest capacity of any of the ice makers on our list and is able to produce up to 48 pounds of ice, almost double the amount of our first two picks. However, it will take up a larger amount of space in your kitchen with dimensions of 17 x 17.1 x 14.9 inches and a weight of 37.9 pounds. Some may consider it too heavy to bring on camping or boating trips, as it may be an inconvenience to lug around. It takes anywhere between 8 and 15 minutes to produce a batch of ice cubes, which is a longer time than both of our top two picks. However, it does produce 12 ice cubes per batch as opposed to 9. It also features a water recycling system so unused water does not go to waste. It will keep the ice cold for a period of time before it melts and gets recycled. The stainless steel look makes it a great addition, especially if you already have stainless steel appliances in your kitchen. The listing price for this appliance is $299.99, which is definitely an increase in price over our other recommended ice makers. However, with the large capacity and abilities of this model, it does make sense for it to cost more. It might not be necessary for everyday use or you may not want too bulky of an item, but if you are throwing a big party with big drinkers, this would be the ideal ice maker for you. The lowest cost item on the list is the iGloo ICE102-Red Compact Ice Maker. It can still produce ice in as little as six minutes which is a huge plus, but it only offers two ice cube sizes and the capability of producing 26 pounds in 24 hours. It can also only store a little over one pound of ice at a time. It weighs under twenty pounds which can be convenient if you often bring the ice maker to parties in other locations. The dimensions are 15 x 11 x 14.5 inches. This particular ice maker is bright red which can add a fun pop of color to your kitchen or entertaining area. However, some people may prefer a more sleek look of stainless steel or neutral colors. It is possible to buy an iGloo ICE102-Red Compact Ice Maker in other colors such as black, white, silver or stainless steel. These options may be a bit more expensive. It offers a 2.3-quart reservoir with electronic LED controls. The current listing price of this particular ice maker is $109.00. If you are looking for a cheaper ice maker for everyday use or one that does not take up a lot of room in your kitchen, the iGloo model is probably the best option for you. Although the price is normally affected by the quality of the machine, this ice maker still works great! The cheap price does not mean that the quality of this ice maker is lacking. With quality building materials used and highly practiced craftsmanship, this ice maker proves itself to be the exception to the rule that cheaper products mean worse quality. As a budget pick, this ice maker will prove to be reliable and dependable in situations where you have forgotten ice and have a number of guests on the way. The speed and quantity of the ice produced should be enough to satisfy the number of drinks at any average get together or party. Some of the most important things to keep in mind when purchasing your new ice maker are the amount of ice it can hold, the size of the ice cubes, the size of the appliance itself, and the look of the ice maker. Everything including the price and the number of people you are expecting to serve should be considered in great detail when purchasing an ice maker as they have the ability to take up an excessive room, and may only be used in the case of special events or at outings. If consistent use is planned with the ice maker, the better product is definitely that which makes the most ice in the shortest amount of time. Due to the various different color options in many of these, be sure to find a ice maker that is an appropriate color for your kitchen theme. When purchasing an ice maker, the first question that comes to mind is, how much ice can it make?! The amount of ice needed for the various aspects of life that an ice maker is needed for can vary greatly. Whether it is a large bash for over 100 people, to a small get together with only closest friends, the amount of ice from the ice maker will dictate drink temperature throughout the night. Ice makers come in sizes that make 10 lbs of ice, up to thousands of pounds of ice on the industrial scale. The price, quality, durability, and operating costs all will vary depending on the function. While some may like their ice cubes crushed, there are others who wish to have their ice cubed. These variations in ice cube type and size differ depending on the ice maker. Some ice makers come with a plethora of functions and the ability to change between smaller and larger ice, and the ability to change the type of ice produced. Depending on the situation different sized ice cubes are preferred and must be taken into consideration before purchase. Depending on the kitchen size, an ice maker can be a bulky machine. If used at large parties, ice makers have the ability to be a popular standing spot while many people come to refill on the continually made ice. Many wish to have the ice maker put away when it is not in use and that may be hard to do with the older, larger ice makers, but many new ice makers weigh very little and take up as little room as possible and can be kept in a discrete location in most areas. In smaller kitchens with less cabinet room, a cheaper ice maker may be recommended as they normally take up less space. With only a singular cord necessary to power most of these machines, the wire clutter in the kitchen will stay at a minimum and will not be greatly affected. Many of the smaller ice makers that make smaller amounts of ice, can be used continuously after the ice is made by simply removing the ice and placing it in a freezer and restarting the process, allowing for a greater amount of ice to come from a smaller machine. In many modern homes, the sleek and cool look is important when choosing appliances for the kitchen or patio. Many higher end ice makers come in classy and elegant designs that blend in well with most modern homes, and also go well with kitchens of various other themes. The bulky looks of the ice maker can be seen in some models, although the bright and vibrant colors normally offset the eye and create a subtle touch to any kitchen. Most of these ice makers are available in a variety of different colors that will accent the layout and design of many different kitchens. Many of the smaller and more compact ice cube makers come with easy to use drain filters that allow the unused water to dispose into an easy to remove tray. This should also be taken into consideration as it may obtrude from the machine. Many machines also have lights and buttons on them that indicate if the water holding mechanism is full, and how much it may have left in it, as well as the type of ice being created. The price is often one of the first things considered when making any purchase. As with most things, an ice maker’s quality will normally reflect the amount of money spent on it. Higher priced items are usually made from higher quality materials and will tend to have longer warranties and guarantees in case of hardware malfunctions. It is not always necessary to buy the most expensive ice maker, as cheaper ice makers may suit the infrequent user. The amount of technology involved normally will dictate the price of the ice maker, since ice makers with touchscreens and buttons and lights that indicate the various functions cost more to produce than its more basic counterpart. The price will often vary depending on the length of the warranty the item has. Ice makers with a longer warranty may often be more expensive since the company is willing to repair or replace the item. For many people who may say that they can simply buy the ice they need for their events at the store, and wonder what the benefits of buying an ice maker would be, the answer is simple, ease of mind and reliability. Even the smallest ice makers are capable of creating more ice than the amount bought in a bag in a grocery store, with the larger models able to produce as much as 10 times the amount of ice than what would be received in a single bag from a store. Ice is also generally one of the last things remembered to be bought for events and parties, but with an at home ice maker it is possible to forget this essential party item and then simply create some with the push of a button, using only readily accessible water available at any sink within the house. This ice can be produced in as little as 6 minutes for some machines, which will come in handy when guests are on their way to the party and ice was forgotten beforehand. Many households that have built-in ice makers within their fridge are much smaller than the stand-alone counterpart and can normally produce only a third of the amount of ice produced specifically by an ice maker machine. Ice makers may not be the most important thing on any person’s kitchen appliance list, but after purchase it will be seen as an incredibly important and handy tool within any kitchen. The convenience of cold ice in any drink within minutes rather than having to freeze water overnight or run to the store to get a bag of ice, will continually reinforce the decision of purchasing an ice maker, no matter the brand or size. People will continue to have get-togethers and parties at their house until the end of time, with drinks always readily available. Ice makers will fill those drinks with ice and keep them cold for all of these times. Ice makers are becoming more discreet and cheaper as the technology in use is evolving and they are able to make more ice in a more restricted amount of space. These machines are capable of producing pounds and pounds of ice at a consistent rate with only water and the use of electricity. What was once a luxury in many beverage holders’ drinks, can now become a right to all of those with a drink at your event. Due to some ice makers taking 24 hours to complete the full ice cycle, it is important to plan use of it ahead of time in order to be positive that the correct amount of ice will be created in time of for the event. While quality is often depicted in the amount spent on any product, it is possible to fulfill all of the desired needs of the average user with a cheaper model of ice maker. An ice maker is capable of filling a vital roll in any kitchen setting, and will come to be useful in many situations throughout the year no matter the time of the year. The purchase of an ice maker may not be the first item on a person’s mind, but it can grow to be one of the most essential tools used in any kitchen setting and will allow you the freedom and piece of mind to know that ice will be readily available during any event or situation that may arise. We try to suggest only products we think people like you would love to own. Have feedback? E-mail us anytime at contac[email protected]. We hope we've helped you find an awesome product that makes your life better.